We were so so glad to wake up to a sun-shiney day!! and stayed at the pool or beach pretty much all day..
and Ty was all about it.. me on the other hand. 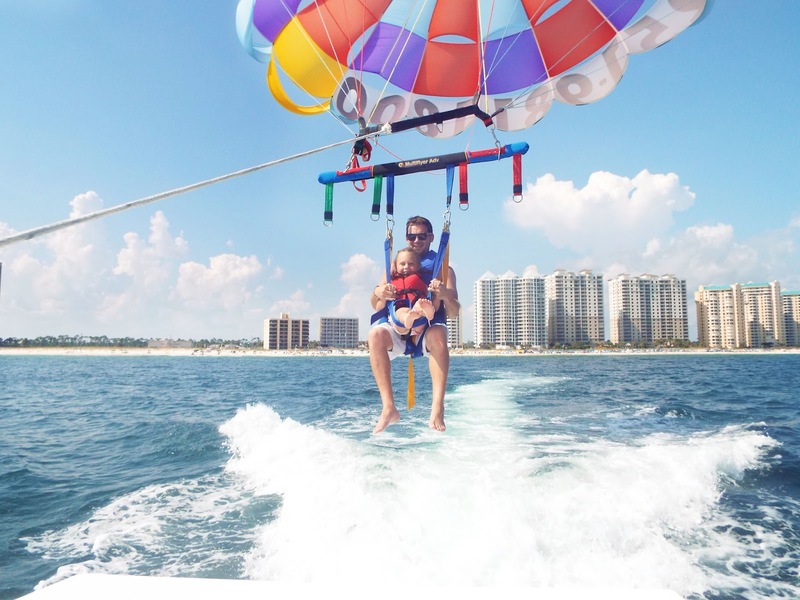 It scared the living crap out of me..
You couldn't pay me to go parasailing because I'm deathly afraid of heights. I kept re-addressing the fact thats she is only 6..
well it took until Wednesday of being there for me to feel ok about it. and that little kids actually are allowed on it. as they were taking off but once they got up higher she got more comfortable and let go..
and said "this is beautiful" - haha love her! When she got down she said she wanted to go again the next day..
and told me all about it and the dolphins she got to see! vacant lounge chairs behind ours to lay her down on. We stayed in and had dinner at the condo that night and went out to hunt crabs after! smart thinker - i totally forgot to mention that to him before they headed off! !